Our families are big animal advocates and began our Pomsky adventure together in 2013. Since then we have enjoyed spreading our Pomsky love with over 100 happy families! It is hard to let these adorable puppies go, so we have developed the VIP (Very Important Pomsky) page, where our Pomsky families can stay in contact with us and always have a trusted Pomsky network that they can turn to. 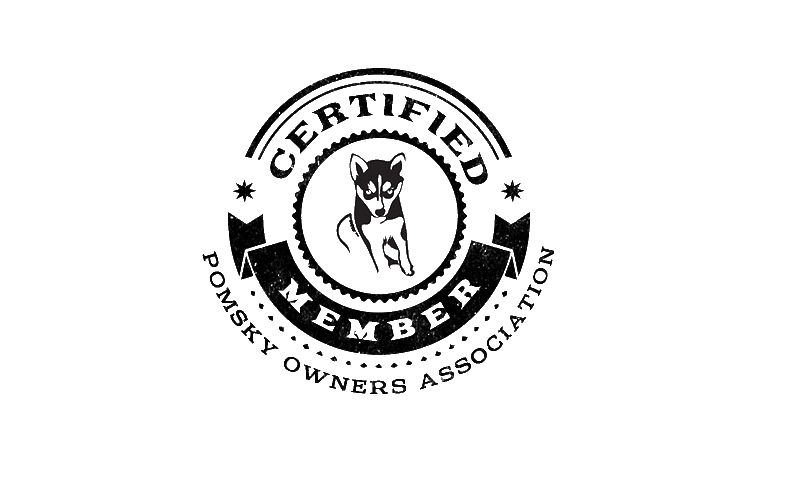 We are members of the Pomsky Club of America as well as the Pomsky Owners Association and adhere to all of their rules and regulations in order to provide healthy and well-adjusted puppies to our owners. The PCA hold breeders to a higher standard so that buyers can safely buy a pomsky knowing that it was DNA verified and that their breeder was maintaining the highest standards for their dogs and puppies. Meet the McGhie family: We are an adventurous family of six outdoorsy animal lovers. After moving to Chattanooga Tennessee (specifically Signal Mountain), we expanded our hearts by adding five Siberian Huskies to our family. We are now more active than ever, but occasionally we find time to relax by hiking, camping, scouting, playing trumpets in the marching band, drawing, reading, skateboarding with our Huskies and so much more. We began breeding Pomsky puppies in 2016 and have found our hearts have expanded even more! We are excited to share our love of Pomskies with the world and look forward to matching our sweet puppies with their “furever” families. We are on Facebook, Instagram, Twitter and YouTube. We also have a special owners page on Facebook called “Neverland Nursery” where our owners can share photos of their puppies, get advice and brag about how smart their puppy is. John is also the proud owner of Dog Days & Cat Naps, the largest pet sitting business in Northeast Florida. Founded in 2000, Dog Days & Cat Naps is known one of the premier dog sitting business in Northeast Florida. We are a family owned breeder that specializes in Pomsky puppies. Our dogs are part of the family, they live with us and interact with us on a daily basis. We adhere to high breeding standards to ensure the safety of our dams and in order to maintain the integrity of our lines.